An employee using a high-pressure airless spray gun injected himself when he inadvertently put his finger in front of the spray tip. Extensive surgery and rehabilitation helped save his finger, but the incident could easily have resulted in the loss of his finger, hand or arm. Airless sprayers are mechanical devices that compress a fluid coating (like paint) to force it through a small opening or “spray tip,” creating a fan or pattern. 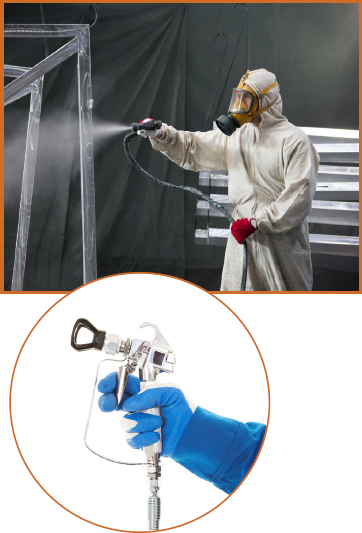 Airless spray equipment generates very high fluid pressure – some reaching 5,000 pounds per square inch (psi). Spray from the gun, leaks or ruptured components can inject fluid through the skin and into your body, causing serious injury, including the need for amputation. The injection may look like a cut, but it is a severe injury. Medical treatment must be sought immediately and physicians must be provided with detailed information on the injected material and recommended actions from safety data sheets or the manufacturer. Read all warnings and instructions in the owner’s manual and keep them on hand. Ensure employees are properly trained and competent to operate the devices. Consult the Safety Data Sheet and manufacturer’s instructions for the recommended personal protective equipment (PPE) when operating, servicing or when in the operating area of the equipment. Never point the spray gun at anyone or at any part of the body. Adjust the pressure to the lowest setting possible. Never put your hand or fingers over the spray tip. Always have the tip guard in place on the spray gun when spraying. Engage the trigger lock when not spraying, even for a moment. Always engage the gun safety latch in the closed or ON SAFE position, making the gun inoperative. Failure to engage the safety latch can result in accidental triggering of the gun. Always follow the pressure relief procedure before cleaning or removing the spray tip or servicing any system equipment. Never try to stop or deflect leaks with your hand or body. Be sure equipment safety devices are operating properly before each use. Maintain, clean and store the airless sprayers and pump according to manufacturer’s instructions; do not store the system under pressure.